CHICAGO -- Amazon opened its fourth Amazon Go smart convenience store in Chicago on Sept. 17, and CSP Daily News editors secured a tour of the facility for an in-depth look inside. The opening marks the first Amazon Go to open to the public outside of Amazon’s hometown of Seattle. It is the second-largest location at 2,000 square feet, and it sits in downtown Chicago just northeast of the Willis Tower (formerly known as the Sears Tower). Like other units before the Amazon Go in Chicago, Amazon streamlines the checkout process through the use of cameras and sensors in the ceilings and shelves. To enter, customers must download the Amazon Go app and swipe a QR code on the app home screen over turnstiles at the entrance. Once inside, the store’s technology follows shoppers closely enough that they can simply grab an item and leave without interacting with a clerk or opening a wallet. Shortly after the customer exits the store, a receipt appears on his or her mobile device with a summary of the purchases made. Amazon calls it “just walk out” technology. “And you just walk out? That’s it?” One customer stood inside the store before the turnstile exit, his purchases in hand. A couple of store employees smiled, nodded and waved him through. It really is that simple. On this second day of business, there were quite a few Amazon employees in the store. A few congregated at the entrance to guide people through using the app to enter. Others were busy stocking shelves and answering questions. While the first Amazon Go to open in Seattle has a mostly orange, brown and dark gray color palette, the walls of this store are mostly covered in gleaming white tile, making the store seem considerably brighter than the first. 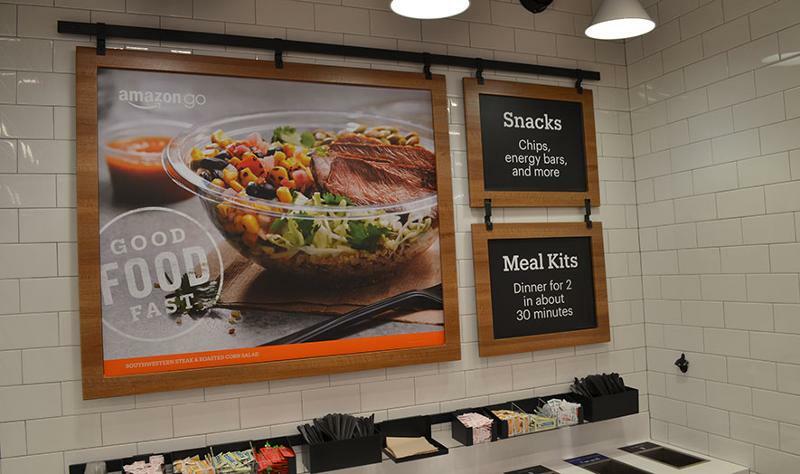 Just as the Seattle locations carry local Seattle fare, the Chicago Amazon Go includes items local Chicagoans might recognize, including 606 Fresh Sandwiches, a brand named after a recently constructed biking and walking trail in the city. Store-branded salads, sandwiches and other grab-and-go foods line the shop. Amazon-branded choices range from the Go Salad, with crumbled goat cheese and chopped dates, to a dish of roasted cauliflower with carrot miso and quinoa. Similar to other locations, the store also stocks Amazon meal kits. The kits are marketed as meals for two that can be assembled in 30 minutes or fewer. Meal-kit options include orzo risotto, roast chicken and falafel patties. Amazon Go has plenty to offer in terms of shopping experience, but it does not carry every item typical convenience store might. The Chicago location does not stock beer or wine, nor does it have an area for packaged food prep, which is completed in an off-site location. Other units, including the first location in Seattle, include both beer and wine, as well as a kitchen in the back where employees prep packaged food. The Chicago store does not include tobacco, lottery or an ATM. Of course, there is little use for cash in a store with no checkout clerks or counters. When exiting the store, shoppers approach a small shelf with two microwave ovens, napkins, plastic utensils and other foodservice amenities they can collect on their way out. What's next for Amazon Go? It is still unclear if Amazon plans to keep its “just walk out” technology in-house or if it will eventually sell the technology to retailers who want to create a similar experience in their stores. Amazon is slated to open more Amazon Go units in San Francisco and New York. The company has given no indication about when those stores might open, but they could be any day now at the rate Amazon has been opening new locations. The Chicago store marks the third Amazon Go opening in a month. However, the juggernaut e-retailer is not the only player in the frictionless-checkout space. Standard Market, a similar frictionless concept from Standard Cognition, opened the first public no-checkout store location. Another concept, Zippin, is also preparing to open to the public in San Francisco. Click here to read CSP’s exclusive inside look at San Francisco-based Zippin. Standard Cognition and Zippin are both searching for brick-and-mortar retailers who will bring their tech to existing stores. Also, Anderson, Ind.-based Ricker’s announced plans to roll out an app-based checkout service in all 58 of its c-stores, and Walmart is reportedly in talks with Microsoft to develop its own version of the no-checkout tech. Click here for a video tour of the Chicago Amazon Go store.